Illustration by Joshua Seong. © Verywell, 2018. Vegetables are considered a cornerstone of a low-carb diet, but some are better choices than others. Knowing the number of carbs in carrots, cauliflower, and other veggies will make low-carb meal planning much easier. Overall, choose vegetables that are less sweet and starchy. 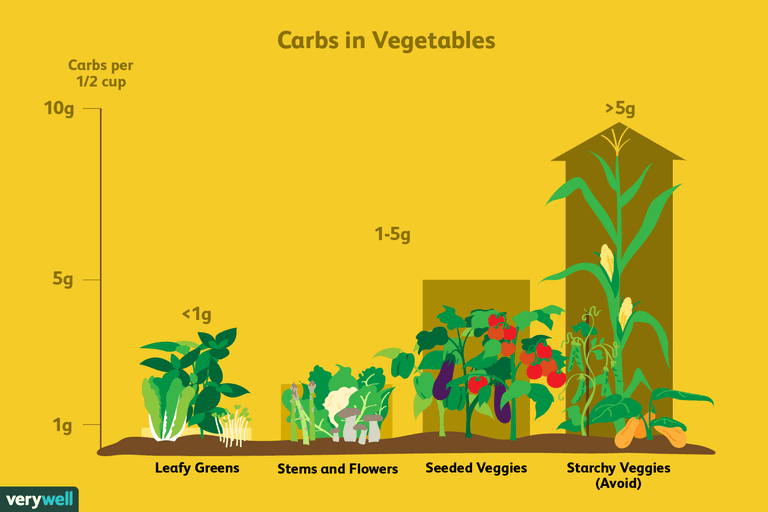 When you do have higher-carb vegetables, be mindful of portion size: 1/2 cup of cooked or 1 cup raw vegetables should contain no more than 5 to 6 grams of carbohydrates. Vegetables are broadly classified as leafy, stemmed, seeded, or root, and carb count will vary according to type. Carb counts also differ depending on whether you eat your veggies raw or cooked. Leafy vegetables have the fewest carbohydrates and the lowest impact on blood sugar. The carbs they do have are mostly fiber, which digests slowly and keeps you feeling full for longer. Dark leafy greens are also rich in vitamin K, phytonutrients, and minerals. While greens are the obvious choice for salads, they're also great additions to smoothies, omelets, and wraps. You can even replace a slice of bread or roll with a leaf of lettuce to create a low-carb sandwich or burger. *Per one cup, raw. Carb count increases when cooked. The carb count of some greens increases when they're cooked. Eaten raw, spinach has 1 gram of carbs per cup. Cooked up, one half-cup serving of spinach will have about 3.4 grams of carbs. Similarly, a half-cup of cooked Swiss chard has about 3.6 grams of carbs. While you can't eat the stem on just any plant, some vegetables have more edible bits than others. In fact, some are entirely edible. You won't have to waste a bite of these stem vegetables. While they have slightly more carbohydrates per serving than leafy vegetables, they're still a good option for low-carb diets. Since these veggies are technically the plant's strong stems, the crisp, firm texture holds up well when put through various cooking methods. They're also rich in flavor and packed with vitamins. *Per cup, raw. Carb count may change when cooked. When cooked, the carb count of vegetables like broccoli and cauliflower will actually decrease: one half-cup of cooked cauliflower has 2.5 grams of carbs. A half-cup of cooked broccoli has 5.6 grams (opposed to 6 grams raw). A vegetable's carb count may change depending on whether you eat it raw or cooked. Botanically speaking, vegetables with seeds are classified as fruits. Like their fruity cousins, some seeded vegetables are considerably higher in carbs. Look for options under the 6-gram threshold. When cooked, the carb count of zucchini and summer squash changes. A half-cup serving of cooked zucchini has 2.4 grams of carbohydrate. One half-cup of cooked summer squash has 3.4 grams. Peas, on the other hand, actually have fewer carbs when eaten raw. When cooked, the carb count increases to 5.6 grams per half-cup serving. When you think of root vegetables, you probably think of tubers like potatoes—which are notoriously high-carb. The association leads to the assumption that all root vegetables must be high in carbohydrates. Adding root vegetables to your low-carb diet is doable as long as you keep preparation and portion in mind. As you can see from the table below, the carb count and fiber content of root vegetables vary a great deal depending on how you cook them. Other root vegetables, such as scallions (green onions) and leeks can be used in soups. A half-cup of raw scallions has 4 grams of carbs, but when used as a garnish for a salad or to flavor a soup, you may not even need a full serving. Similarly, raw leeks have 6.3 grams of carbs per half cup. But if you're only adding a few to your omelet (to give it a milder flavor than onions, for example) you may not need a full half-cup. Parsnips have 16.6 grams of carbohydrates per one-half cup raw. Winter squashes, such as butternut, acorn, and spaghetti squash, can have up to 15 grams per one-half cup when cooked. Corn, when cooked and cut, has close to 16 grams per one-half cup. Water chestnuts have close to 10 grams in just 1 ounce. Sweet potatoes, cooked with skin, have about 21 grams per one-half cup. One medium-size artichoke has about 14 grams. Baked yellow plantains have 29 grams per one-half cup. Boiled green plantains have 20 grams per one-half cup. One small baked potato with skin has over 29 grams of carbohydrates. One-half cup of boiled potatoes (with or without skin) has about 16 grams. Potatoes are also very high in starch and have a high glycemic index (the only root vegetable with a higher glycemic index is parsnip). Carbohydrates in foods with a high glycemic index are rapidly turned into sugar and absorbed into your blood. You don’t have to avoid root vegetables entirely, though: when baked and roasted, radishes make great low-carb potato swaps. With half the carbs, mashed turnips work well as a substitute for mashed potatoes, and sliced rutabaga makes a great swap for french fries. For an even lower carb count, try cruciferous vegetables like cauliflower. One cup of cooked cauliflower has only 2.55 grams of carbs. Once cooked, cauliflower can be lightly seasoned and mashed. If you’re missing other carbs, like pasta, try pulsing whole, cooked, cauliflower in a food processor and swap for rice. Larger chunks can be used as a base for low-carb potato salad. Though technically a fruit, tomatoes are a frequent addition to salads, stews, and pasta dishes. One half-cup of raw, chopped or sliced tomatoes has 3.5 grams of carbohydrate. Cooked, they'll pack 4.8 grams. Using the same fruits-as-veggies logic, olives are another popular choice. With 3 grams of carbohydrate per cup and plenty of inflammation-fighting properties, olives are great as a topping or popped on their own as a quick snack. Finally, while they're not technically a vegetable—or even a plant—mushrooms are another low-carb option. The nutrition-packed fungus can be used to top salads, thrown into an omelet, or eaten in slices. A cup of raw white mushroom pieces has just 2 grams of carbohydrates. Cooked, they're 4 grams per one-half cup. Looking to start a low-carb diet, but not sure where to start? Sign up to get our free recipe book and enjoy delicious low-carb meals.